Whether you are updating some of your office's interior or moving into a new place, look for ways to incorporate recycled materials in your office scheme. Using recycled materials allows you to reduce your carbon footprint and show your customers your commitment to doing something nice for the environment. Look for opportunities to recycle in all corners of your office -- from using recycled paper for your business cards to upcycling older office chairs and furnishings. Your appliances and light bulbs could be costing you money! That little red standby light that you can see on many electronics means that there's actually a trickle of electricity pumping through at all times. Turning items completely off will save you energy. 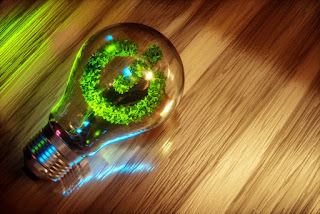 Swapping traditional light bulbs for low-energy fluorescents is another eco-smart change! Have you gained some inspiration for ways to make your office more eco-friendly? These easy tips are ones that -- once you get in the habit -- you're unlikely even to notice are there. Some of the changes may even benefit your staff, and all will help make the world a better place to live both now and in the future.